With Microsoft announcing that it will start auto-updating Internet Explorer from January, it seems that we’re finally dragging the digital dawdlers into the modern Internet age. Right? Erm…right. But what about operating systems? Windows accounts for over 80% of all computer operating systems, but recent figures show that Windows XP – launched initially way back in August 2001 – is still running on almost a third (32.8%) of all machines. The figures are according to W3Schools, a Web developer’s portal containing tutorials and data relevant to Web development. The stats were collected from W3Schools’ log-files over a period of seven years. 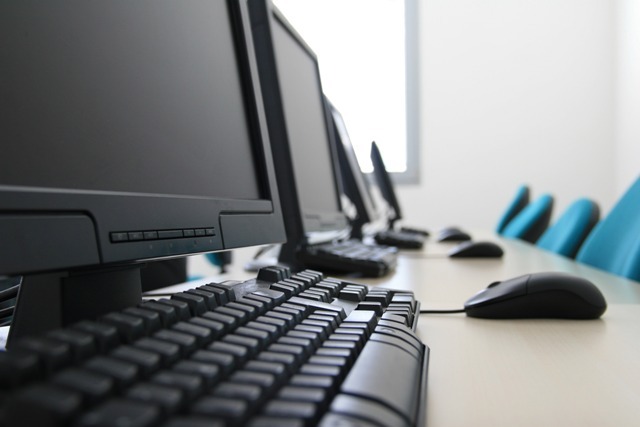 Delving a little deeper, in November 2010 Windows XP constituted almost half (47%) of all operating systems, and it seems that the massive drop is likely to do with users buying new machines with Windows 7 installed, as that has shot up over the same time-frame from 28.5% to 45.5%. Though of course some users will have merely upgraded the OS on their existing machine. Whilst Linux remained roughly static at around 5%, Mac OS gained some ground, rising from 7.7% in November 2010 to 8.8% this year. This is at odds with reports from last month, however, that Apple’s Mac platform commands a 5.2% share of the global PC market, according to analysis by Needham & Co. 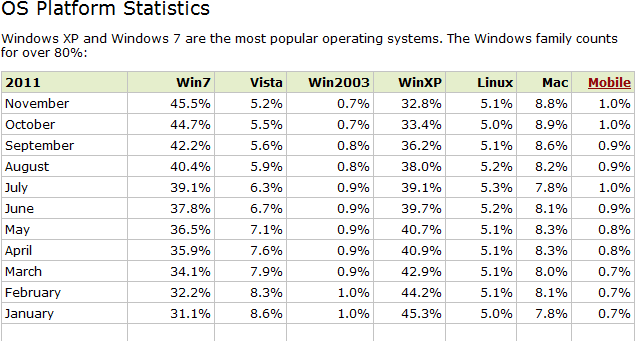 The short-lived Windows Vista dropped from 9.5% to 5.5%, with Windows 2003 still running on 0.7% of computers. There’s no sign of Windows 98 or 2000 in this year’s figures though, which I guess can only be a good thing. Mainstream support for Windows XP ended in April 2009, but extended support will be available until April 2014 for Windows XP with Service Pack 3 and Windows XP x64 Edition with Service Pack 2. But going by the current downwards trajectory, by 2014 XP will likely constitute a small fraction of personal computers.